Neapolitans always considered Alfonso (image, above) a foreigner, particularly because of his habit of surrounding himself with only his own countrymen and giving them the choice positions at court. Apparently, towards the end of his life he changed his mind about this and passed on to his son, Ferrante, a few bits of advice: avoid the Spanish, lower the taxes and keep on good terms with the princes in Italy, especially the Popes. Alfonso was regarded as a cultured person; he founded an excellent library, and artists, poets, philosophers and scholars were an integral part of his court. In the field with his troops, he lived the same life as his men and exposed himself to danger in battle with no regard for his own personal safety. They say he also went among the common people incognito to find out how things were going. He liked to listen rather than talk and claimed to be a simple person, once saying he would have been a hermit if he had had his choice in life. Because of his patronage of the arts he became known as Alfonso the Magnanimous. He also started the total rebuilding of the Angevin Fortress, fallen into ruin since its completion in the late 1200s; he paved the streets of the city, cleaned out the swamps and greatly enlarged the wool industry that had been introduced by the Angevins. In spite of his pretensions to simplicity, he was addicted to splendor. At a Neapolitan reception for Frederick III of Germany, the order of the day to all the artisans in the Kingdom was to give Frederick's men whatever they wanted and send Alfonso the bill. Then they all went hunting in the great crater known as the "Astroni" in the Phlegrean Fields and had a banquet at which wine flowed down the slopes and into the fountains for the guests. Parties, however, did not prevent Alfonso, by the time of his death in 1458, from also having developed the Kingdom of the Two Sicilies into the foremost naval power in the western Mediterranean. Alfonso's illegitimate son, Ferrante, succeeded him (as Ferdinand I) and, in spite of extreme hostility on the part of the feudal lords in the kingdom (part of which included a long war called the "Barons' Revolt), succeeded in strengthening the monarchy at their expense. He also drove the Angevin fleet from Ischia, their last stronghold in the area. Ferrante countered baronial hostility most violently. To show the barons that feudalism was truly dead he made a lot of them dead, by doing things such as inviting them to weddings and then arresting, jailing and executing a number of them. They say that some were fed to a crocodile that prowled the dungeon. (A skeleton of one such reptile hung over the arch in the Castle until quite recently.) He even mummified some of his late enemies and kept them on display in the dungeon of the Castelnuovo (the alternate name for the Maschio Angioino, meaning, simply "New Castle", thus distinguishing it from the older Castel dell'Ovo, the Egg Castle). The French reappeared with designs on the throne of Naples. Under Ferrante's successor, Neapolitan resistance to the French was utterly ineffective and the French, under Charles VIII, took the city virtually unopposed; indeed, they were welcomed by most of the nobility, who sensed a chance to recoup their losses. Their toadying didn't work. The French pillaged the city, anyway, and dispossessed a number of the nobles. Charles, however, suddenly found himself cut off: The Papal State, Milano, and Venice—which had just let Charles pass through unhindered on the way to Naples—suddenly formed an alliance behind and against him. Charles had to fight his way back home, attempting along the way, and failing, to bribe the Pope into crowning him King of Naples. The jibe by historians is that the French brought two things back from their Italian campaign: the Renaissance and syphilis, one of which history has dubbed morbus gallicus in their honor. France then tried something else: the proposal of an Alliance to Ferdinand of Spain against Spain's own Aragonese relatives in Naples, by virtue of which the Kingdom of Two Sicilies would cease to exist and be divided between Ferdinand and Charles. This would effectively give them both one less rival realm in the area, as well as squelch the heresy that it wasn't nice to carve up one's own cousins. Ferdinand went for it and even Machiavelli, himself, later said that Ferdinand had certainly needed no lessons from anyone in ruthless princemanship. The pact of Granada was signed on 11 November 1500; the Kingdom was to be divided, with the capital, Naples, going to France. The French reentered Naples in July 1501. It now seemed, however, that both France and Spain had had their fingers crossed at the signing of the original treaty, so they had a war over it and Spain won. 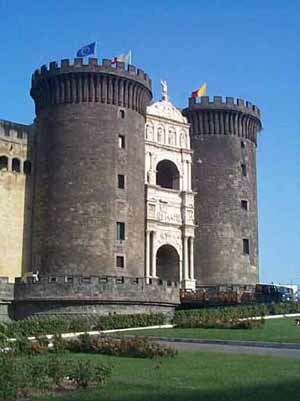 In May 1504 Spanish troops evicted the French and entered Naples, ending the Aragonese dynasty. 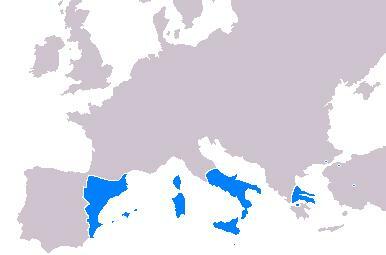 The Kingdom, intact, became a colony of Spain. Naples was now no longer the capital of its own realm. In a few year's time, with Charles V of Spain crowned Holy Roman Emperor, heir to the Caesars and Charlemagne, it would be part of an empire as it had been more than a thousand years earlier. True, the East had fallen and what was left of Christian Empire was all in the West, but after 1492 'West' meant something monumentally different in human history. The Empire had shifted, spreading from Europe to the Americas and on to the Pacific. The age of Empires on which "the sun never sets" had arrived. then you are not going to paint his girl friend. Croce then continues with the tale of a strange love story between the 18-year-old Lucrezia d'Alagno and the 54-year-old monarch. Lucrezia is surely the least remembered of all the women who have either ruled in southern Italy or been close to the men who have. She was one of seven siblings and was born around 1430, which made her 18 in 1448, when Croce starts his tale. Her family's home was modest but pleasant, set amidst gardens in Torre del Greco on the slopes of Vesuvius near the sea. Her father, Cola d'Alagno, was a captain of the guard in nearby Torre Annunziata and came from noble lineage. They were comfortable but not wealthy, not even well-off, so it was said. The first encounter between Lucrezia and her sovereign must have been by chance, perhaps on the streets of the capital city, Naples. They say she was a stunning beauty, pale, with long hair, intelligent and strong-willed but diplomatic. She just knew what she wanted and what she wanted was the king. For the next 10 years (until his death in 1458) she had, by all accounts, this very powerful ruler totally wrapped around her little finger. And by no accounts did he ever complain about it. Alfonso had lived apart from his wife, Maria of Castile, for the better part of thirty years. She stayed in Spain, and his brother acted as regent over Alfonso's domains there. At one point in Naples, three or four years before he met Lucrezia, he sired an illegitimate son, Ferrante (called Ferdinand I in history books) whom he made his heir to the throne of Naples (which, indeed, happened upon Alfonso's death). Alfonso had soldiered most of his life, had fought his battles, and now he was simply struck by lightning. He spent as much time as possible at Lucrezia's family home in Torre del Greco where he had a room in the residence as well as living in the tower on the cliff overlooking the sea. Or he would hold court out in the other direction in Pozzuoli or Baiae amidst the relics of ancient Rome. All the while he showered great wealth, gifts and concessions upon Lucrezia and all of the d'Alagno family. There was nothing secret about any of this. He conducted affairs of state, but her presence was a constant. They were openly affectionate in the presence of others, not seeming to care who saw them embracing. She was accepted as his companion. Even the Holy Roman emperor Frederick III just had to see this remarkable woman for himself and showed up with his own queen at her residence in Naples. Lucrezia always behaved like the queen she wanted to be and was treated as such. She used her position to acquire wealth and property for herself and her family. (The king gave her the island of Ischia!) Members of her family were elevated in rank, some even acquiring fiefs. It was said that if you wanted something from the king, you had to go through Lucrezia. But she knew how to moderate herself. When the emperor came calling on that occasion, Lucrezia knew her place in the pecking order: Mrs. Emperor was first, the king's daughter-in-law, Ferrante's wife and future queen was second, and she, Lucrezia happily came in third. tantum Campanas superat Lucretia nymphas. [As the King surpasses the nobles, as the Sun conquers the stars, so Lucrezia surpasses the maidens of Campania." ] By Antonio Beccadelli [1394–1471], known as il Panormita ("The Palermitan"), poet and friend of Alfonso. It may be that because of such worshipful verse she acquired an almost religious reputation of purity; the relationship with the king was passionate, yes, but, at least according to local lore, almost certainly platonic. The person or persons who wrote her epitaph (bottom of page) apparently believed that to be so. Croce points out that it makes no difference what the real truth about Lucrezia was. She seemed to be about "beauty and empire" he says. Whether she was a schemer or not, out to enrich herself or not, was mostly irrelevant. The important thing was the impression she made among the populace as well as at court. She was surrounded by Spanish gentlemen, poets, scholars, and the aristocracy, all of whom were still willing subjects of their distant queen, Maria of Castile and who were willing to transfer some of that loyalty to a new queen. It was totally favorable. Or almost. There was ill feeling not from Ferrante, the future king, but rather from his wife, Isabella of Clermont. The people may have wanted a queen, but Isabella figured they would have one soon enough—her, and she didn't like being upstaged by a charismatic charmer. But in the minds of the people, that had already happened, anyway; that's all anyone talked about—the king marrying one of his subjects. True love right from a fairy tale. The obvious problem was that the king and his queen consort back home could not divorce. There was no such thing. No one really knows who first broached the idea of an annulment to Alfonso, but if you guess Lucrezia, that's maybe not a bad guess. This conversation may have happened. (It sounds better in medieval Aragonese pseudo-spousal baby-speak, but the only expert in that field has not yet been born. I note, pretentiously, that Benedetto Croce missed this completely. Alfonso: Yes, true light of my life and fire of my lions [at 70, his loins had pretty much had it], what boon wilt thou have of me...here, have some jewelry. Peel me a grape. Lucrezia: Well, I was thinking more like boonanza. How much longer must I and my big strong kingie have to wait for that old crow of your wife back home to croak, go belly up, go to be with Jesus. Whatever. Then we can marry and be true King and Queen, just like everyone wants. Alfonso: Hard to say. Here, have some more bling. Get it to the Cayman Islands. Lucrezia: They haven't been discovered yet. Alfonso: What, are you Christopher Columbus all of a sudden? He'll sail some day for my brother, by the way; we expect great things. But right now he's only 6 years old. Trust me, I have astrologers. The Caymans are solid. Anyway, here is what you shall do. Then he explained how she would go to Rome to talk to the pope, one of Alfonso's relatives. It was pretty much a done deal, he said. An annulment from the pope—what could go wrong? Callixtus III (image, right), was a Spaniard and, indeed, related to Alfonso. The king sent the young love of his life off to Rome for an audience with the pope. She went like a queen in an entourage of 500 horses and ample ladies and lords in attendance. She was received in kind, royally, by the vicar of Christ. Royally with all the trimmings. Except one. No annulment. That would be a sin, and apparently the pope told Lucrezia that he had no intention of “winding up in hell with both of you.” That was in October of 1457. They had had nine good years. Alfonso had waited in Capua for her and rode north to meet her as she returned with the bad news. Now the fairy tale ends abruptly. They consoled each other for eight more months. Then Alfonso died in June of 1458. (The ultimate irony was that his legitimate spouse back in Spain died two months later!) Things went downhill for Lucrezia quickly. She paid her due respects to her new king, Ferrante (Alfonso's son) then dressed in mourning black and talked of entering a convent. Two things then happened: one, Ferrante (probably at his wife's prodding) started to expropriate Lucretia's property and wealth. It seems that Alfonso, in spite of his boundless generosity towards Lucrezia, had left her out of his will. It's hard to view that as oversight. My guess is that in the mid-1450s Alfonso was 70 years of age—that was old. He was intoxicated with Lucrezia, but he may have been concerned with the future of his line. Lucrezia already had a lot of property and a fleetload of jewelry. She would not hurt. (He had no inkling of the intense power struggle that would engulf the Kingdom upon his demise.) Important was that his son should become king and his wife, Isabella, queen. Alfonso had arranged that marriage a few years earlier. Isabella was one of the most well-endowed (in the sense of feudal land holdings, of course!) in the south. Lucrezia, on the other hand had had him! What more could she ask for? As noted, she wouldn't go hungry. Two, upon Alfonso's death, the barons in the realm, who remembered the good feudal life under the previous Angevin dynasty, revolted almost immediately against the new king; an Angevin army landed to support the barons and there ensued an agonizing six-year war, ultimately won by Ferrante. At the beginning of the war, Lucrezia had a choice to make. At first she swore loyalty to the Aragonese kingdom; then, the tides of war turned in favor of the Angevins and Lucrezia went over to them, even offering one of her castles to a revolutionary baron. When the final battle, however, went to the Aragonese, the whole revolt collapsed; the barons were done and Lucrezia, who had committed treason, made a run for it. She fled to the Dalmatian coast under the protection of the Republic of Venice, then returned to Italy in October of 1464 to Ravenna. Finally she “surrendered” to Ferrante by letter, saying she wanted to live in her kingdom again and would be willing to live anywhere in the kingdom as long as it wasn't near the queen. Ferrante wasn't as vindictive as he might have been. He said he would pay her a small pension and she could live in some place like Bari on the coast of Puglia, but she could pretty much kiss her wealth good-bye. She was outraged and decided to stay in Ravenna selling off her jewelry little by little to live. Then she moved to Rome near Piazza San Marco. Croce says she doesn't seem to have suffered in poverty. She gave her niece a significant amount of money as a wedding gift and in her will left money to her relatives and the San Domenico monastery in Naples. She was known as Madama Lucrezia in the quarter of Rome where she lived. Croce writes that the legends about her persisted even at the time of his writing his tale. (1919). 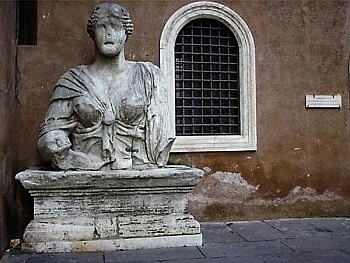 There is still (2017) a large bust (right) of a woman at the corner of Palazzo Venezia, near where she lived and now 100 yards from the great national monument to the first king of united Italy, Victor Emanuel II, in Piazza San Marco. It is actually an ancient Roman statue, but has been called “Madama Lucrezia” for centuries. I finished my life in Rome and here I lie. There is a small street named for her in Naples, supposedly near her residence in the heart of the ancient Greco-Roman city. F. M. Apollonj Ghetti, "Madama Lucrezia quasi una regina", in Donne di ieri a Roma e nel Lazio, «Lunario Romano VII», Roma, Gruppo Culturale di Roma e del Lazio, 1978, pp. 15-53. M. A. Causati Vanni, "Lucrezia d'Alagno: madama parlante", in Roma: ieri, oggi, domani, nº 68, June 1994. Benedetto Croce, "Lucrezia d'Alagno", in Giuseppe Galasso (ed. ), Storie e leggende napoletane (con relativa nota bibliografica), Milan, Adelphi, 2001, pp. 89-120. Many thanks to Selene Salvi for her assistance. 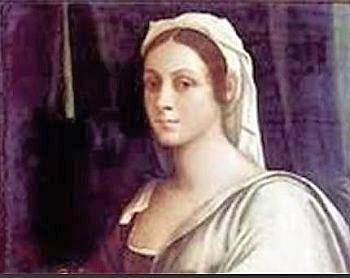 Loise de Rosa (Pozzuoli,1385 – Naples, 1475) was a writer of the 1400s in Naples. He was from a simple background and had only modest education. He started writing late in life after having spent an entire career in charge of the staff of servants (maestro di casa) at the Angevin court and then the Aragonese court of the kingdom of Naples, first in the service of the last Angevin rulers of Naples, and then in the service of Alfonso the Magnanimous (see item 1, above), then Alfonso's son, Ferrante of Aragon (1443-1495), and then Ippolita Maria Sforza, Ferrante's granddaughter. ...and then Croce is off into his tale of Loise de Rosa because he recognizes the linguistic insight (rather than historical knowledge) that the “story and legend” of one such as Louise de Rosa can provide. If you remember high school Spanish, that might help. 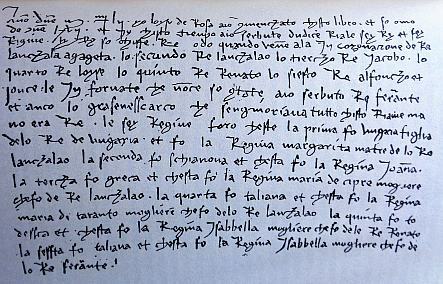 De Rosa is noted for a single work, one of the first pieces of literature written in the local language of Aragonese Naples, a chronicle that is noteworthy as a part of the literary panorama of the spoken language of the 1400s, and not just of Naples but of a peninsula-wide trend that was just gearing up. Based entirely on the spoken language of the servant class, essentially illiterate, De Rosa's language is very different from that of the “high literature' of the day, which flowed from the cultural environment of the Renaissance humanists at those courts. There is potential for confusion here. When we say, “literature written in the spoken language of the day,” is that not what we find with the grand trio of literati—Dante, Boccaccio, and Petrarch—who championed the use of the vernacular language instead of Latin (see a complete discussion of vernacular here). Not really. That was an attempt to create a “universal” Italian as a language of empire, as opposed to the language of the Catholic church, Latin—it was very much a part of the church vs empire conflict of the time (the so-called Guelphs and Ghibellines, respectively). Italian thus wound up more or less like the vernacular Tuscan dialect of Dante, but it was an educated language moved by the spirit of Renaissance Humanism stirring in Italian universities, a spirit that emphasized human potential rather than religious values. But Dante was not a humanist. It is true that his Divine Comedy, completed in 1320 gave us the first great poem written in vernacular, but (1) it was a poem, and most people—even Tuscans— don't speak in rhyming verse stanzas of 11 syllables to a line; (2) it was a religious poem and represented more of a medieval religious world view, not an attempt to revive classical logic and philosophy. The humanists active after Dante, such as Boccaccio and Petrarch (called the Father of Humanism), came from university environments and were scholars, manuscript collectors, lawyers, even chancellors of Italian cities. They wrote and spoke both Latin as well as their own local brand of dialect—but even that language was educated and, to the extent that it then slowly developed into official court or national language, it could be as ponderous then as official language still is today. If offers no insight into how the common folk really spoke. De Rosa does. Opinion of De Rosa's work is positive. The extreme closeness of his language—the absence of refinement or literary pretension, makes De Rosa an important document for the study of the history of the Neapolitan language. Stylistically, he is devoid of literary pretension or fanciness. It is, according to Croce, almost transcription, oral history, with no attempt to write up. Croce, indeed, compares it to a sound recording; “...for him, the pen is nothing more than a phonograph.” As history, however—a record of what really happened—that is not particularly useful given what we now know about the unreliability of eye and ear witness accounts, “invented memories” and such things. Bit linguistically it is a valuable tool. The memoir is in three parts. The first one is by far the longest. It is a long series of recollections of his life and career in Naples and is addressed to “Donno Alonso”. It's not clear if the reference is to Alfonso the Magnanimous or to his grandson Alfonso II of Aragon. More likely the former, since the stories stress the simplicity of this first Aragonese ruler and his penchant for such things as going incognito among the people to hear what they really thought. It is interesting that, whoever he is, he speaks Catalonian Spanish in de Rosa's stories, the language that had become the official language of the kingdom when the Aragonese took over from the French. Although the events are not necessarily in chronological order, the memoirs start from about 1452 under the reign of Alfonso the Magnamimous (image, right, painting by Vicente Juan Nasip). In talking about himself, de Rosa claims a barely plausible array of offices he has held, from viceroy of several districts and towns, to a vice-admiral of the royal fleet and majordomo of important households. Though exaggerated, it is apparently the case that he at least served as master of the household to several Neapolitan monarchs. He was more than just a glorified butler—more than the title “maestro di casa” makes it seem. Part 2 is shorter and is a hilarious justification of why Neapolitans are the best people in the world. It has a certain logic to it: Since Europe is obviously better than Africa and Asia, and since Italy is the best part of Europe, and since Campania is the best part of Italy and Naples the best part of Campania... therefore, etc. etc. Long list of criteria: better air, better water, better weather, the mountains, the sea, abundance of game. Better doctors. Better streets with better churches and even better miracles! (Come on! What do Rome and Venice have to compare with a vial of San Gennaro's blood that miraculously liquifies?!). You name it. Naples is better. Ipso facto. Buy the premise, buy the bit. Part III (written around 1271, much later than parts 1 and 2) is a time-line of events of Neapolitan history from the time of Konrad IV of Hohenstaufen (1228-54) (son of Frederick II and who ruled as “King of Italy” and “King of Sicily”) up to de Rosa's own time. It is not considered very accurate and is of scholarly interest only due to the natural dialect writing and the light shed on the lower social classes. Much of the material is out of chronological order, so we can make sense of it only by remembering who was whose son or daughter. It is full of flashbacks and probably smaller insertions from the author's diaries and notes that are no longer extant. Princeton Legacy Library, Princeton University Press, Princeton, 1987. Croce, Benedetto. Storie e legende napoletane. (ed. Giuseppe Galasso) Adelphi, Milan, 2001. -De Rosa's Ricordi (memoirs) have been edited twice: G. de Blaiis, "Tre scritture napoletane del secolo XV", in Archivio storico per le provincie napoletane, IV, 1879, pp. 411-467, SBN IT\ICCU\NAP\0391412.1879 and Antonio Altamura's Napoli aragonese nei ricordi di Loise de Rosa (Naples, 1971). The latter includes a glossary of Neapolitan dialect as used by De Rosa. -There is a critical edition of the Italian manuscript (ed. Vittorio Formentin), catalogued as ms. Ita. 913 in the National Library of France, published in Italy in 2 volumes at Roma and Salerno, 1998, ISBN 88-8402-261-4. (The yellow image, top left, is of one of those volumes. The facsimile in the middle of the page is from the National Library of France. Since I have a large body of entries in these pages loosely grouped as "Everything is related to Naples" (ErN on the menu bar, top of page) here is one I really want to be true. It is the solution to the riddle of the Voynich Manuscript. Various sources refer to it as the most vexing case in cryptography ever! It is an illustrated codex hand-written in an unknown writing system. The vellum on which the manuscript is written has been reliably carbon dated to the early 1400s (1404-1428), and the ink is consistent with that period. The manuscript is named after Wilfred Voynich, a Polish book dealer who purchased it in 1912. If you are one who delights in this kind of mystery, you can forget the Da Vinci Code. This is the real thing. The manuscript is also called "Beinecke 408" after its catalog number in the Beineke Rare Book and Manuscript Library at Yale University in New Haven, Connecticut, U.S.A., where it is currently held. ...[probably]...was simply a very localized version of the proto-Italic alphabet. Indeed, it may have been exclusive to the court of Castello Aragonese." You can read the rest at the links provided above. I encourage you to do so if this sort of thing interests you. The first paper, Missing Links is remarkably consistent within itself. My few questions have largely to do with general history and language and are not about the author's transliteration of the unknown script or his translations into English of his own transliterations. 1. I think Proto-Romance is the same as Vulgar Latin* ("Latin of the people", i.e., the Latin that people spoke in whatever part of the Western Roman Empire they happened to be living as the great empire fell apart. I wonder if the author is using Proto-Romance to cover even later versions of what histories of literature simply call medieval Spanish, Italian, French, etc. For examples, histories of the Italian language always list a poem by Francis of Assissi (Cantico delle creature) from 1200. 3. I don't know what a proto-Italic alphabet is. Why is the alphabet used by the Romans not proto-Italic? It is not linguistically sound to use "diluted, corrupted and simplified" when talking about proto-Romance or really any language. That sounds like shorthand for "primitive". It is standard linguistic canon that there have been no primitive languages in the world for at least many tens of thousands of years. All that has happened is that proto-Romance became "morphologically reduced", meaning that future "Romance" languages lost the Latin system of case declensions, which is what all Romance languages now have in common. The Italian of Dante is not a diluted, corrupt, or simplified form of Latin. It's just different. It's the same thing that happens when a human family splits up and has a family reunion 25 years down the road and they speak in slightly different ways. Parents don't like the idea, but the language of their children is not "diluted, corrupt, or simplified." It's different. Except in cases of pathology (aphasia) in the brain, language does not move backwards. It moves sideways. 5. Last one. The author says the author (who is likely a foreign-speaker or writer), moves to Ischia (Naples) and used a script she found in use and that there was no contender script. But there was. A short distance away, you have the written language of Loise de Rosa (item 3, above) whom Benedetto Croce called a "phonograph". He wrote in the alphabet of his day (the same as Dante, Boccaccio, Pontano) but with absolutely no literary style. He wrote the way people talked, which is why Croce calls him a valuable source for the study of the real language of early Aragonese Naples. I am grateful to Mr. Cheshire for telling me about the Voynich manuscript. I had not heard of it. His comments on these points are directly below. I'll clear up those 5 points. 'Vulgar Latin' is generally used to describe the spoken Latin between the fall of the Roman Empire and the beginning of the Medieval. Thus, proto-Romance is the term used to fill the gap between Vulgar Latin and the modern Romance languages. There are no known examples, until now. [2[ The name 'Castello Aragonese' is used everywhere else - including Google Maps, so it would be confusing to use the 'proper' Italian name. [3[ Similar to the language, the modern Italic alphabet also went through its own evolution, so the manuscript shows an intermediate or prototype version: i.e. proto-Italic. Again, there is no known example, until now. The Roman version is not the same thing, as it comprised only uppercase symbols; many of which were quite different. Also, various Italic alphabets existed before standardisation. The intention is to express that proto-Romance is a transitional and, indeed, corrupted version of Latin. Classical Latin became bastardised by the European population during the Dark Ages, because it was largely spoken and not written for several hundred years - so effectively, yes, it became more primitive and mixed with words from other languages - this was the foundation for the evolution of the modern Romance languages. Classical Latin took another course, by surviving among those who were still able to read and write: i.e. the church and learned institutions. Lois De Roca's work was still written using the familiar Italics of learned society, which is why Croce was able to translate Roca's writings. But, yes, I agree that it should be a useful cross-reference tool as Roca used the same contemporaneous spoken vernacular: i.e. 'phonograph' as Croce describes it. Thank you for making me aware of this, by the way - I'll update my papers accordingly. One needs to understand that language and writing were not at all standardised during this period, so different versions would have been found all over Europe. It just so happened, that the version used in the manuscript died out through lack of use. This is why I suggest that the author used an alphabet unique to Castello Aragonese, as the intended reader/s must have been able to read it along with the author. Think of language and writing like species - they diversify and speciate - some survive and evolve, whilst others go extinct or become re-absorbed. It is a logical process. Spanish-Arab culture dominated most of the Iberian peninsula for 700 years. The Alfonso mentioned above, the one who ruled the Crown of Aragon from Naples is related to Alfonso X of Castille of the 1200s (remember, there was no "Spain", yet). Alf the Xth was a great patron of music and the arts (as was our Alfonso the Magnanimous 200 years later, who came to Naples directly from Spain). The images shown below are of many medieval European and Arab instruments of the period. I found the images and the short text in a copy of Aramco World. Aramco World (formerly Saudi Aramco World) is a bi-monthly magazine published by Aramco Services Company, U.S.-based subsidiary of Saudi Aramco, the state-owned oil company of the Kingdom of Saudi Arabia. The bimonthly magazine is published in Houston, Texas, address, Aramco World P.O. box 2106, Houston - Texas, 77252-2106 USA. The magazine covers issues of the Arabic and Muslim world, but very often, how those issues intersect with the Western world. In 2004, the magazine's website was awarded "Best Magazine Website" by the Web Marketing Association, and the paper issue is widely regarded as one of the most beautifully laid-out and lavishly illustrated magazines in the world. Of particular interest is the yearly "bi-cultural" calendar inserted in their Nov-Dec issue every year (and is removable for hanging). It juxtaposes the Muslim Hijri Calendar and our Gregorian Calendar such that you can readily see, for example, that April 2, 2018 on the Gregorian calendar corresponds to the 16th day of the month of Rajab in the year 1439 on the Hijri calendar. The comparison and explanation has been by the same author for a number of years, the late Paul Lund. Also, each calendar is dedicated to a particular theme. The last one (from November-December 2017) was on "Tarab and the Art of Music, by Kay Hardy Cambell. "For more than a thousand years, performers, listeners and scholars have recognized tarab as one of the most important esthetics in Arab music." (Beyond that sentence, I would be in violation of Aramco's reprint restriction that text not be abridged or edited.) The good news is that you can download a beautiful (and free!) .pdf file of the whole calandar, all 28 pages. Like most calendars made to hang on a wall, the top part is an image having to with a theme (this year, Tarab music). The bottom part, the part that dangles down, is the calendar itself. I chose our month of October 2018 (which covers parts of the months of Muharram and Safar, 1440 Hijri) because it is about Spanish instruments of the 1200s, instruments used widely on the Iberian peninsular, including in coastal regions dominated by the Crown of Aragon and bear a striking resemblance to instruments imported into the kingdom of Naples when it was taken by Aragon in 1400. Some of them are clear cousins of modern woodwinds. In the 13th century ce [common era], King Alfonso x of Castille in Spain produced a book of more than 400 songs in praise of the Virgin Mary. Known for his patronage of music, Alfonso assembled court musicians that included Muslims, Jews and Christians. The manuscript illuminations areone of our most vivid sources depicting musical contact between Hispano-Arab and European cultures. The woodwinds, like the shawm, or double clarinet, and bagpipes, resemble the zurna, mijwiz and habban of the Middle East. The illustration of an Arab and European musician playing long-necked lutes, top left, particularly captures the era’s storied cross-cultural music-making.